I adore fresh artichokes but they are such a pig to prepare and often you are rewarded with very little for your efforts other than black fingers. This risotto however, makes it all worth while as you do not waste a single leaf or stalk of the artichoke, using everything you normally discard to make a beautiful gold stock full of flavour. So thrifty that even the tough ends of the asparagus are used! I have also been known to nibble on the tiny fleshy bits attached to the artichoke leaves as a post dinner treat clearing up the stock pot. 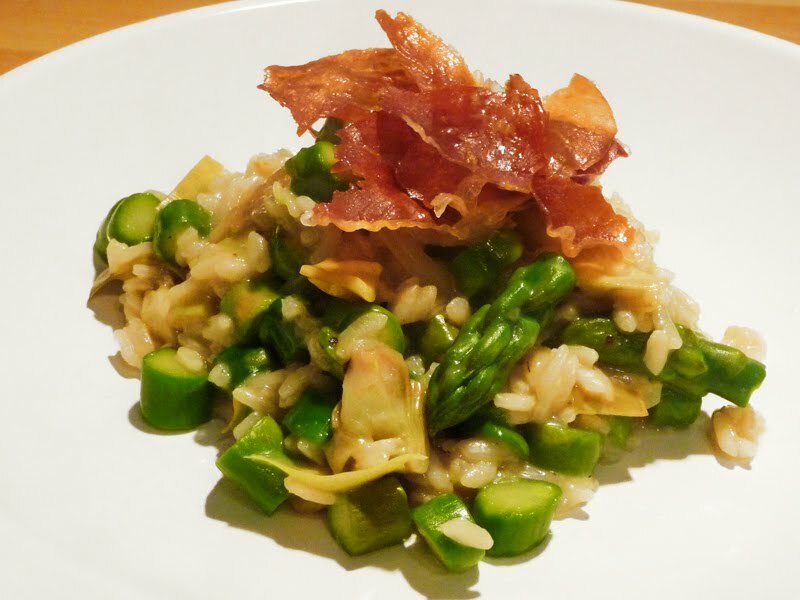 The delicate flavour of this risotto is pepped up with a slice of dry fried prosciutto which you can omit for a vegetarian option if you need to. Heat a large pan with 700ml water to boiling for the stock. Fill a small bowl with cold water and the juice of half a lemon which you will put the hearts into. Cut the top of the artichoke (more than you think) and the stalk with some of the base. The hard leaves should now come away, peel these away until you are left with just the artichoke heart. Place the stalks and leaves into the stock pan along with the half onion and tough asparagus stalk bases. Simmer gently to create the stock. Cut the hearts in half and remove the "choke" and discard. Tidy the base and any tough pieces you cut off can be thrown into the stock pan as well. Finely slice the heart. Place the prepared heart slices inside the water with the lemon juice and dip your fingers in as well if you haven't put on latex gloves. Put a heavy bottomed pan on the stove on a high heat. Fry off the prosciutto until brittle, remove and set aside. Cool the pan a little before adding a glug of olive oil. Add the finely chopped onion and gently fry until soft. Add the risotto rice and coat in the oil. Add a glass of white wine to the rice and stir until absorbed. Begin to add the artichoke stock ladle by ladle, stirring until absorbed before adding the next ladle. The more work you put in the better. After abut 10 minutes add the artichoke slices and the sliced stalks of the asparagus (NOT the tips) and continue to cook the risotto, adding the stock. After another 5 minutes, add the asparagus tips. Continue to cook until the rice is cooked but still has a little bite and the vegetables are tender (about 5-8 minutes). Take off the heat, add the grated Parmesan, season well and stir through. Serve on warmed plates topped with the crispy prosciutto shards.